For the past couple of years I had prayed along with my wife Terri for an opportunity to take a mission trip if it was God’s will. When an opportunity was brought up to us during the summer of 2015 about going to Peredo, Haiti we were both excited, but we also knew much prayer had to be put into this. After praying about this we were excited to join the team consisting of members from Churches in WV/VA. Almost immediately Isaiah 6:8 popped into my mind where it says: “Then I heard the voice of the Lord saying, ‘Whom shall I send? And who will go for us?’ And I said, ‘Here am I. Send me!” From this point on we knew we were doing exactly what God wanted us to be doing. I had been on two different mission trips while I attended Johnson Bible College (Mexico in 1997 and China in 2000), but from everything I was hearing this one was going to be different. We were told we would see things we have never seen before and we would meet a people that we would fall in love with. As soon as we arrived in Haiti this was evident. I went from being someone who was not just sent to Haiti, but someone who was immediately being Humbled In Haiti by poverty. From the moment we first stepped foot on Haitian ground we were humbled. In America we step outside of an airport and we have nice buses to take us to beautiful hotels, clean roads and smooth roads to travel on. In Haiti we saw none of this. We saw the exact opposite as we drove on bumpy roads where the bigger vehicle owns the road and trash was piled up on the sides of the road. We didn’t see power lines everywhere or towns being lit up by lights. I had heard that 88 percent of homes in Haiti do not have electricity and it didn’t register until I actually saw it. In America we must have our three meals a day and a nice warm shower followed by a change of clothes, but in Haiti many are content if they can get one meal a day, no shower and just wear the same clothes on a daily basis. ​During our VBS time this poverty was once again evident. While a VBS in America must have an insane amount of decorations, music and crafts, a Haitian VBS can be done with sincere simple Love. There was nothing special about the way we did VBS in Haiti. They sang songs in their language like Father Abraham and I Have Decided To Follow Jesus. We taught them about Jesus and Prayer. They did simple crafts and loved playing with jump ropes after craft time. But the most humbling experience was feeding these lovely children on the second and third days of VBS. A simple meal of rice on a paper plate with one small piece of sausage and a small string of onion brought smiles to their faces and tears to ours. Even more humbling was the fact that some of these children would save part of their food to take home to share with family. It was an honor to bring VBS to 150 children on day one and 205 children on day two and 250 children on day three. While there I was also Humbled In Haiti by their worship. Just describing it on paper does not do it justice. 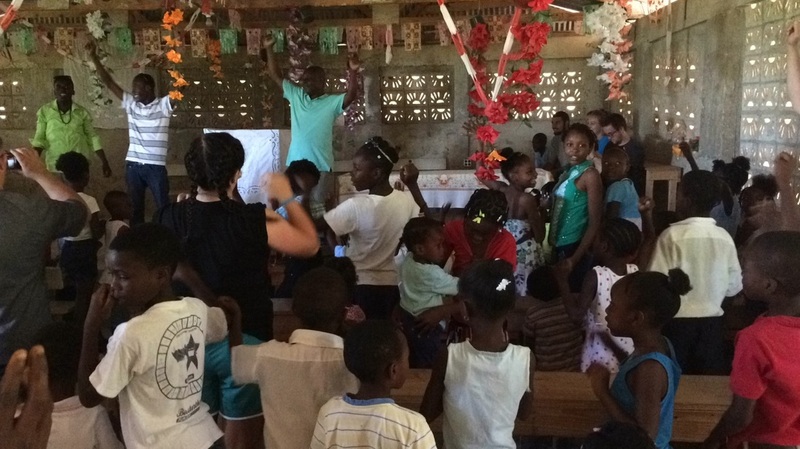 Worship in Haiti is vastly different than in America. In America we need to entertain people with instruments and great voices, but in Haiti all they need is a place, a voice and the heart for worship. They sing as loud as they can and nobody seems to care how well they sing and they shouldn’t. There is no time limit, nobody looking at a watch to see if the preacher is about to finish. They are there to worship God and even though their Church service was so simple and in their language we were all able to worship God. I believe that in some Churches in America we have God on the side for when we need Him, but while sitting in the heat, in a service that was two hours longs I felt the presence of God the entire time. I was told that some people would walk 2-3 hours just to come to Church service and after the service this blew me away. I was blown away because someone would come 2-3 hours on foot, not for any type of entertainment, but for pure worship. They come to sing songs to God, pray, take part in communion and hear a sermon. 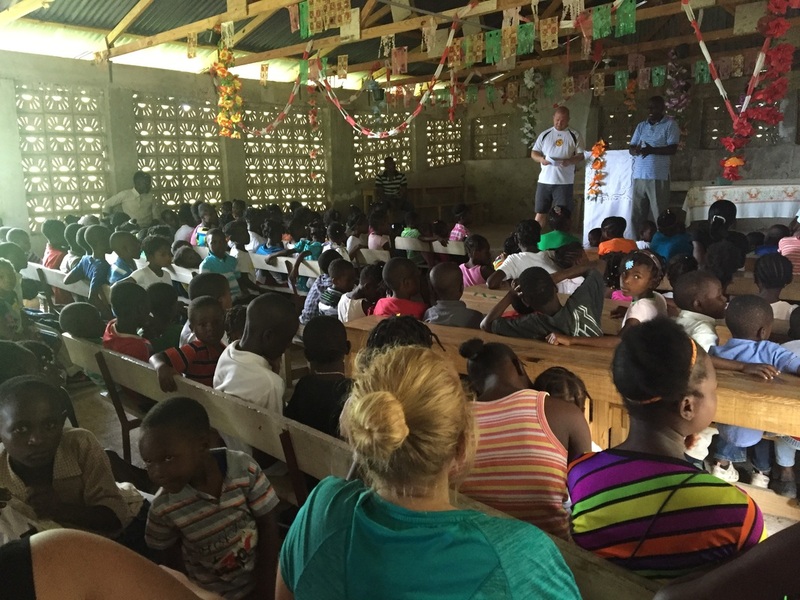 It’s a simple Church, simple service and a simple message that is spreading throughout Haiti. There are so many ways I could talk about being humbled there, but I guess it all comes down to the fact that I was Humbled In Haiti by their humbleness. I could talk about being humbled by their joy, by their service, their work or their hearts. I could tell you about the love we received from these people, but the humbleness of the Haitian people was evident and I continue to be blown away by this. How could people who have so little, who have no opportunity for wealth be so humble? RoRo founded Haitian Christian Outreach in 1985 and his wife Eline has been there to support him the entire time. Whenever I think of RoRo I think of James 4:10 where it says “Humble yourselves before the Lord, and he will lift you up.” Here is a man who has planted 10 Churches through this organization throughout Haiti, opened schools for Haitians to be able to learn, built a Hospital in Peredo and yet he takes no credit for it. When RoRo tells his story he will tell you that he didn’t do any of this. When RoRo tells his story he will tell you it was all done because of people like you and me. I was humbled by this humbleness the entire week. Listening to the story of RoRo and his work through Haitian Christian Outreach is like reading through the book of Acts. Of course there are others within this organization who taught us all humbleness. We were thrilled to have Cameron Mayhill with us on our trip. Cameron is the Director of Development for HCO and he is a man with the same humble heart as RoRo. Cameron will pack up and leave the comforts of his home to go to serve in Haiti. Cameron has left his wife and children over 30 times to work in Haiti over the years. You can’t do something like this without a humble heart. Our team was taught about humility by the humbleness of the Haitians and people working for HCO and I thank God for this often. We started out this process knowing that we were being sent as a team to teach others about God and his love. Once we were in Haiti and until this day I have learned what it really means to humble yourself and let God lift you up. We are very thankful for the opportunity to have been Humbled In Haiti. There is a saying that goes, "Off to the forest I go, to lose my mind and find my soul." There is much truth in that saying, as one can clearly see the attributes of God in creation. The beauty of nature points to the majesty of God in numerous and undeniable ways. But there are other things I like about spending time in the woods: building friendships! 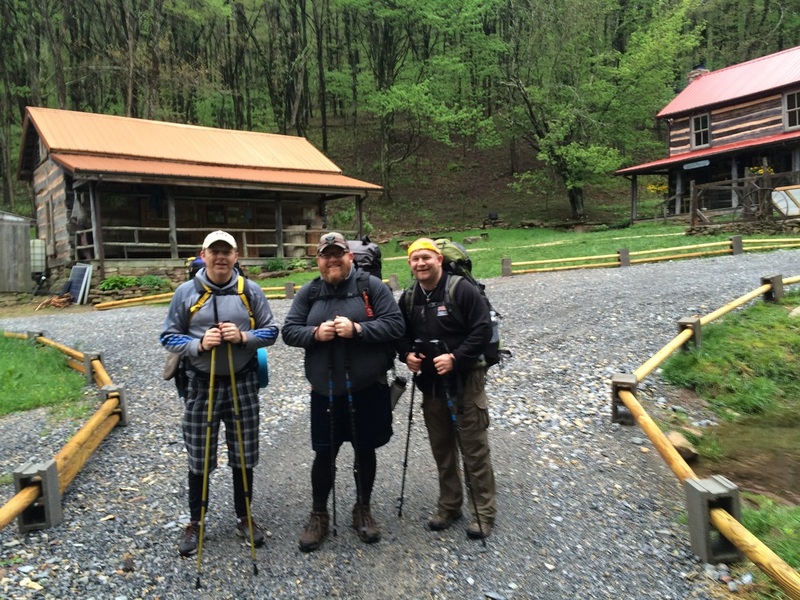 A few months ago, John Elmore (BCE Board Member), Brian Taylor (Student/Board Member) and I (Richard Hodges, Professor) went on a three day hike on the Appalachian Trail. 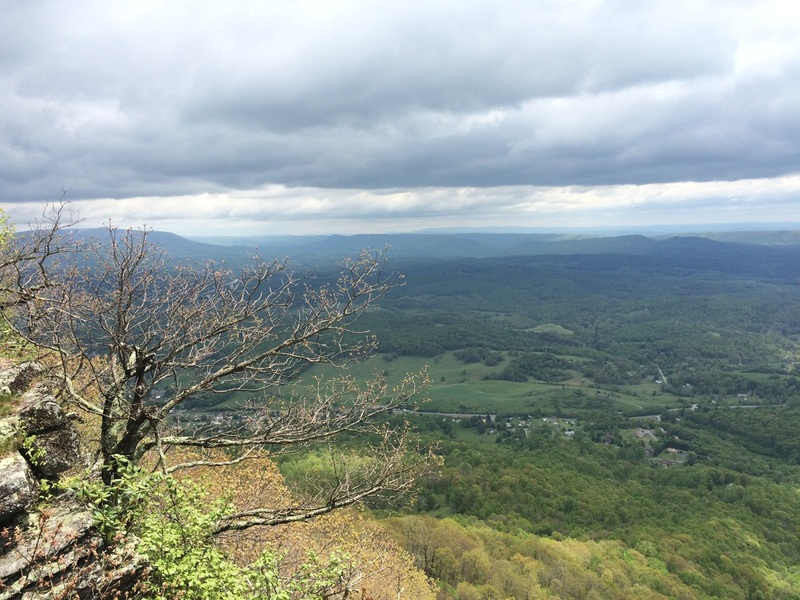 We began at Bland, VA and ended up at Pearisburg, VA, which was a hike of approximately 30 miles. While the weather proved difficult (rain, ice, snow, and 32 degree weather), the experience was fantastic. We talked about our walk with God as men, and how God was using us in the congregations we serve. We talked about Scripture, God, the world we live in, and the bright future of BCE. I left the experience physically exhausted, but spiritually uplifted. Upon reflection of the hike, I have concluded that Christian friendships are the best. You can share your struggles and joys to sympathetic ears. You can learn much about yourself as you hear how God moves in the lives and the experiences of others. You can share dreams and visions and plans and seek the prayers of others as you try to be sensitive to God's leading in your life. I am thankful for BCE and how she continues to bring people together in so many ways. Not just in the classroom setting, but bringing people together in ways that allow us to share life with one another. Building lasting relationships is vital to any walk with God, and I am thankful for these two brothers-in-Christ! 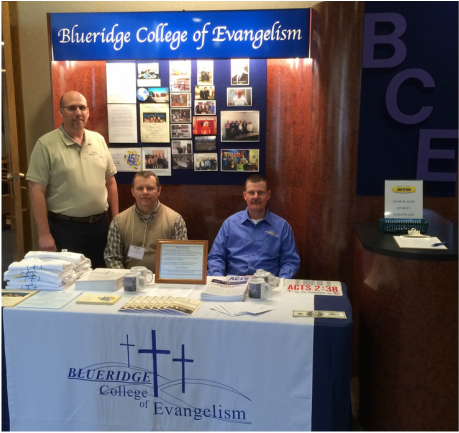 BCE IS REPRESENTED AT THE NATIONAL PREACHING SUMMIT! On March 7 and 8, Raymond Christian, Lorin Sloan, Bruce Barilla, and I attended the National Preaching Summit in Indianapolis, Indiana. The purpose of the trip was twofold: for spiritual edification and growth as preachers, and to represent BCE in order to hopefully gain support from additional churches or church members and to reach potential students. The BCE display was set up and located at the front door of the sanctuary. It looked fabulous, and did not take long for it to draw attention. There were approximately 200 preachers and potential preachers at the summit. They were inquisitive about the college. Numerous questions were asked regarding the college’s location, mission, number of students, etc. We gave away BCE tee­shirts, coffee mugs, and ink pens. We also advertised the upcoming events at the college. Some people took our school catalogs and added their names to the BCE mailing list. It was a great blessing to be able to explain that BCE is striving to train preachers and workers in the Lord’s Kingdom and that we are standing on God’s word and have no intention of backing down. Overall it was a wonderful experience and I am very optimistic that we may have gained support and interested students. At the very least about 200 more people know who we are and what we stand for. This is a seed planted and watered, and now we pray for God to give His increase. Check back often for news and events and engaging articles written by the faculty and students at BCE.